Ok I have to admit that I lied to you guys last week. Last week I said strawberries and any and all things strawberry-related were the best thing in the whole wide world. And while that is not entirely wrong, I hadn’t had the peaches I’ve been scarfing down like crazy this week either. 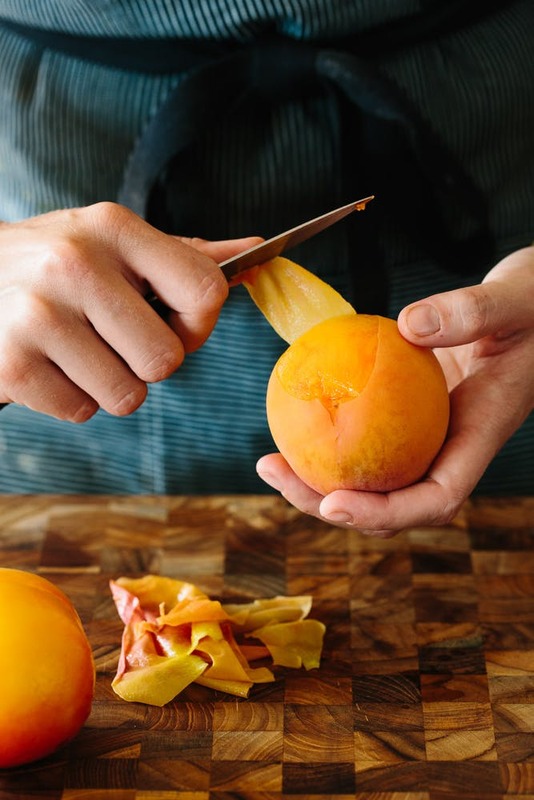 It is peach season, folks, and I stand by saying that it doesn’t get better than standing in pure delight at the sink eating a sweet, ripe peach with the juice running down your arm. I don’t see any reason why I will change my mind and go back on that statement. But then again I am almost 9 months pregnant and these kind of hard-core cravings and bold statements are the norm these days :) Just a couple weeks ago I polished off an entire ginormous watermelon 90% by myself in just a couple days. Then the following week was my strawberry kick with the strawberry shortcake and all things strawberries. I couldn’t get enough! This week I’m going with peaches and staying here for as long as I can! And because of some helpful tips I’ve been learning about freezing peaches for when they are not in season anymore, I can enjoy them for months to come! But you might ask me why you can’t just get canned peaches. To me canned peaches taste about as much like peaches as a watermelon flavored Jolly Rancher tastes like watermelon. It is not even the same thing in my mind. When I want peaches, I want PEACHES. Real peaches to be able to throw into a smoothie or peach pie. 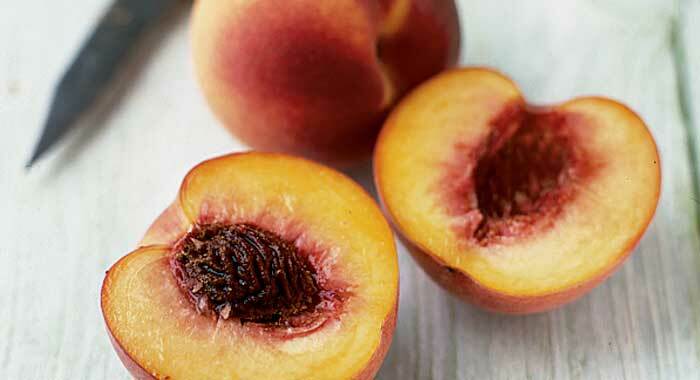 Here are a few benefits to freezing peaches rather than just buying the canned variety. If it is the middle of January and you can’t kick your craving for peach cobbler you can either pay about $57 a pound for a bland peach from the grocery store because they are not in season, or you can pray that you still have some frozen peaches in the back of your freezer from summer. This way you know what you are getting every time. Freezing and thawing also breaks down the fruit’s cells, making them taste more juicy—even if they aren’t as sweet as a fresh one in August. Like I said, peaches are ridiculously expensive for many months of the year. Thankfully, they are the cheapest and most delicious at the same time so it’s best to stock up and freeze so you can be the winner of the Thanksgiving pies this year with some delicious, in-season peaches just waiting for you in the deep freeze. Bring a large pot of water to a rolling boil. Make a small X in the bottom of each peach. Lower the peaches into the boiling water and leave them there for 30 seconds. 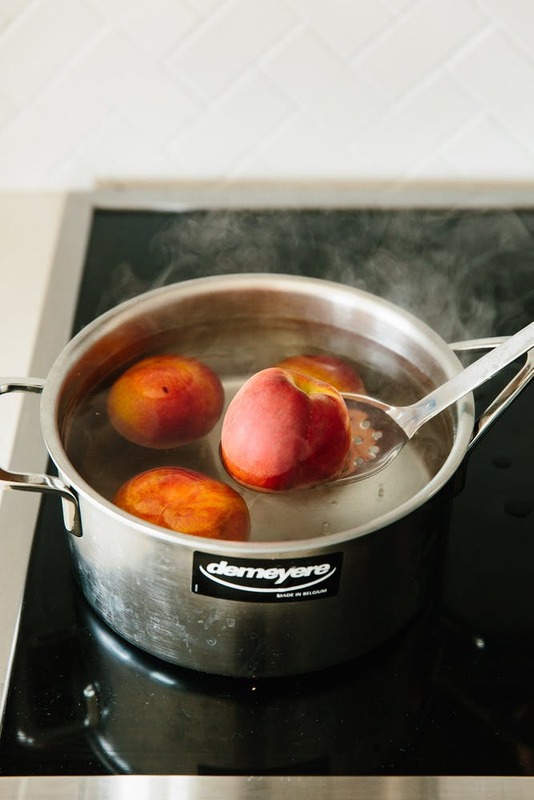 Use a slotted spoon to remove the peaches and place them immediately in an ice-water bath. Gently rub the skin and peel it off; it should come away from the flest with minimal effort. Pit the peaches and slice into ½ inch thick slices. Toss with lemon juice: in a large mixing bowl, toss the peaches with the lemon juice to thoroughly coat. Lay the peaches out onto a parchment paper lined baking sheet in a single layer. Freeze until solid, about 4 hours. 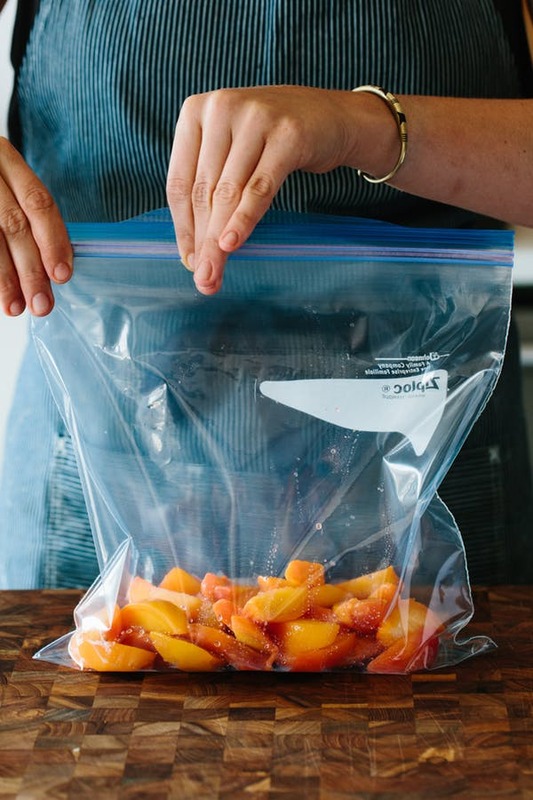 Remove the peaches from the baking sheet into a labelled ziptop bag. Seal the bag by removing as much air as possible. Return to the freezer.